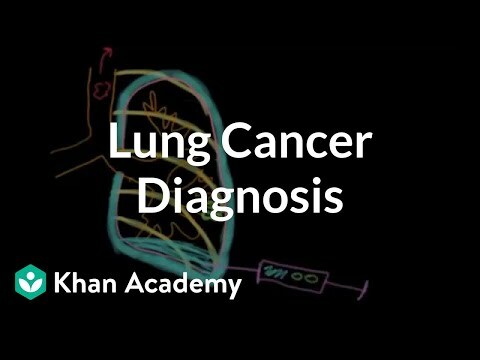 For the patient who exhibits any symptoms of lung cancer or who has had an x-ray where something suspicious has shown up, there a several techniques available in order to obtain a definitive diagnosis. Although an x-ray will show worrying shadows, other tests for lung cancer will be required to determine whether or not any form of carcinoma exists. An imaging technique called computer tomography or CT scan is a step up from an x-ray while positron emission tomography or a PET scan offers a far more extensive visual representation of the area in question. A harmless radioactive isotope is injected to light up particular areas, because tumor cells absorb the material in a different way to normal cells. Radiologists can then examine the resultant scans. However, an actual sample of lung tissue remains one of the best methods of detecting tumors and can be obtained by a biopsy. A common method of obtaining a sample is through a procedure called a Bronchoscopy. The patient is anesthetised and the doctor will then pass a flexible tube down the throat or through the nose. At the end of the tube are small scissors that clip off a tiny piece of tissue which is then sent to a pathologist who will examine the sample for tell tale tumor cells. Mediastinoscopy is a more invasive technique whereby a small incision is made at the base of the throat into which the doctor guides a small tube down into the lymph nodes in the chest. Because one symptom of lung cancer is fluid in the lungs, otherwise known as pleural effusion, extracting some of that fluid can give doctors clues. To obtain the fluid, a technique called thoracentesis is used. This procedure entails a physician inserting a thin needle through the chest wall between the ribs. The liquid is then sucked up through the needle and examined for evidence of cancer cells. There are supplemental data and tests that a physician will use for lung cancer diagnosis. A medical history is important, since many choices, such as smoking increase the odds for lung cancer. A family history is recorded, since genetic factors play a role. Pulmonary function tests, such as spirometry, help determine how efficiently the lungs are operating. Lung cancer develops in about twenty five percent of cases where patients show no outward symptoms at all in the early stages. Therefore, early detection is essential to provide the widest number of treatment options for lung cancer as well as the best possible chances of full recovery.